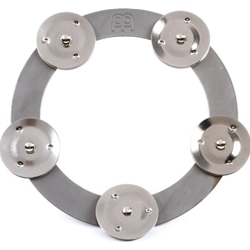 The Meinl Ching Ring effect tambourine is a great way to add a different accent to your playing. Using it is a piece of cake. Simply place the Ching Ring directly on one of your cymbals and play as usual. The drummers here at Remix have found that the Ching Ring not only sounds great with a hi-hat, it also makes an interesting effect when used on crashes and rides. Add a cool shimmer to your drum sound with the Meinl Ching Ring effect tambourine!